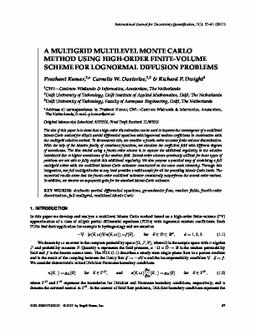 The aim of this paper is to show that a high-order discretization can be used to improve the convergence of a multilevel Monte Carlo method for elliptic partial differential equations with lognormal random coefficients in combination with the multigrid solution method. To demonstrate this, we consider a fourth-order accurate finite-volume discretization. With the help of the Matérn family of covariance functions, we simulate the coefficient field with different degrees of smoothness. The idea behind using a fourth-order scheme is to capture the additional regularity in the solution introduced due to higher smoothness of the random field. Second-order schemes previously utilized for these types of problems are not able to fully exploit this additional regularity. We also propose a practical way of combining a full multigrid solver with the multilevel Monte Carlo estimator constructed on the same mesh hierarchy. Through this integration, one full multigrid solve at any level provides a valid sample for all the preceding Monte Carlo levels. The numerical results show that the fourth-order multilevel estimator consistently outperforms the second-order variant. In addition, we observe an asymptotic gain for the standard Monte Carlo estimator.